There will be random thoughts about dyeing, marbling and quilting. Hopefully there will be some information that is new to people. 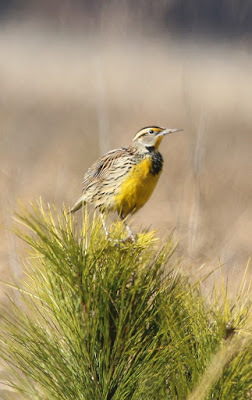 Nature is my inspiration and because of that, I reserve the right to publish lots and lots of pictures of animals, birds, butterflies and plants! My daughter and I took our annual trip to northeastern North Carolina on a beautiful weekend in late January so that we could catch the Tundra Swans, Northern Pintails and Snow Geese. 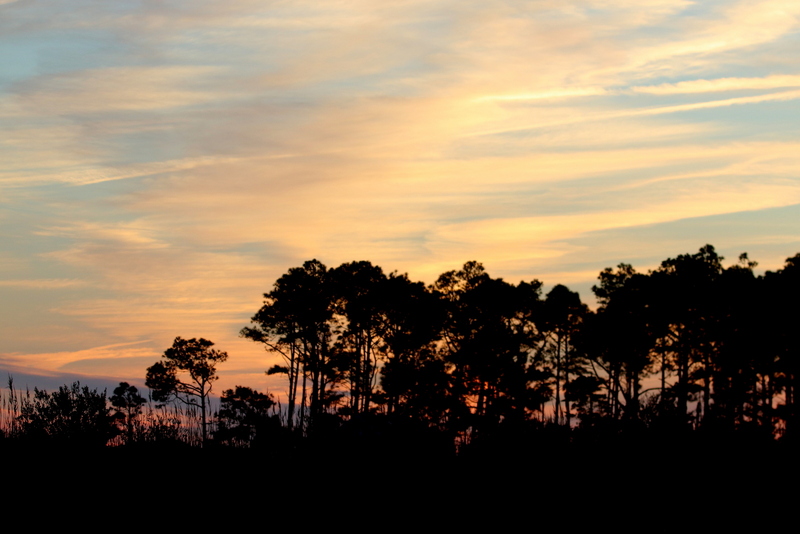 A bonus was this lovely sunset over Bodie Lighthouse on the Outer Banks on our first evening. Our first surprise was driving along Route 264 on our way to Lake Mattamuskeet. 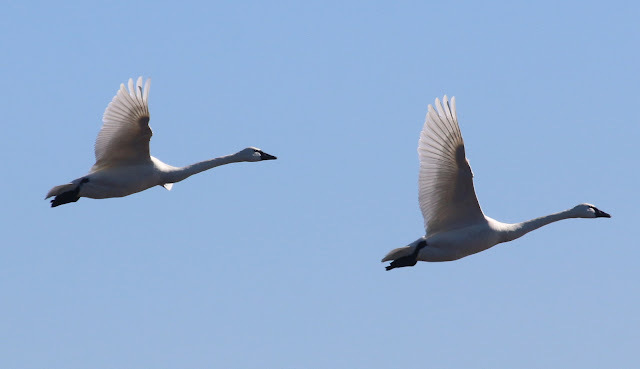 There was this temporary pond that was filled to overflowing with Tundra Swans who kept taking off and landing. They were off quite a distance except the flyovers. 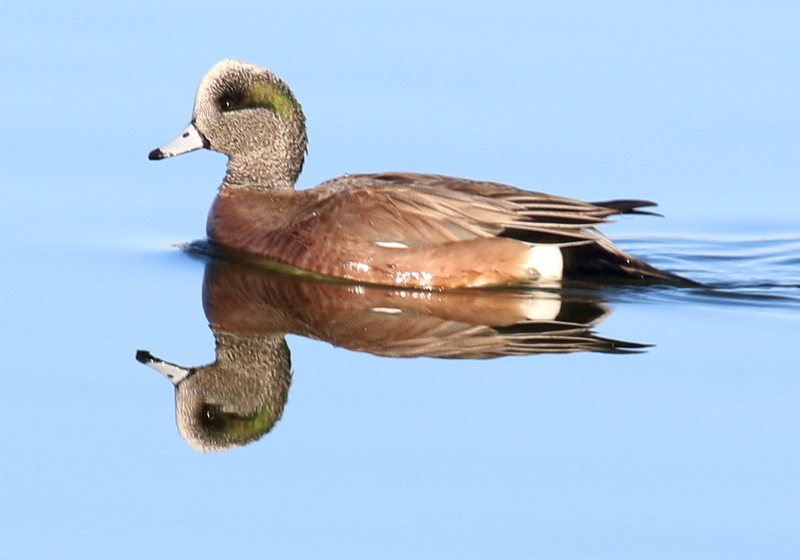 There were obviously some other ducks in the pond as well but not good enough to identify. These are two of the Tundra Swans that flew over us. You can see what a beautiful day it was. We also saw a couple of fields filled with Snow Geese off in the distance (I am assuming they were Snow Geese as that is what I usually see off in those fields). 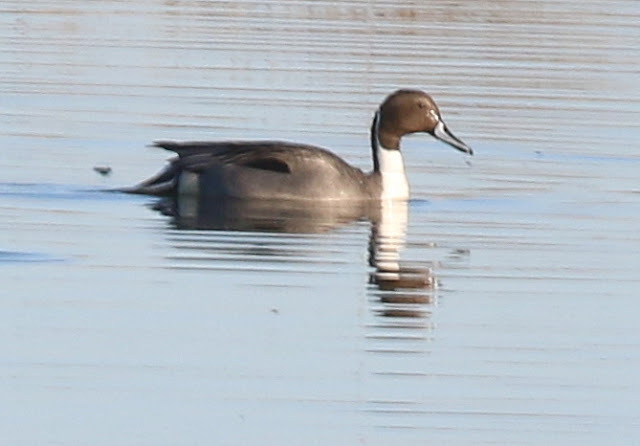 We weren't disappointed at Mattamuskeet as there were hundreds of Northern Pintails. We got a couple of pictures before the bright noon day sun was too much to get decent shots -- a common problem at Mattamuskeet for me. 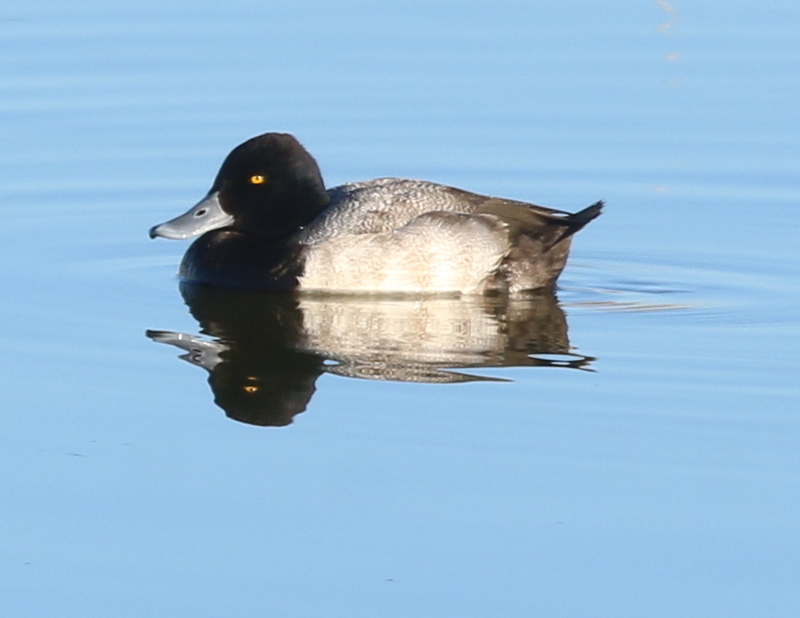 We did see many Northern Shovelers, Blue-winged Teals, and of course lots of American Coots and Canada Geese. 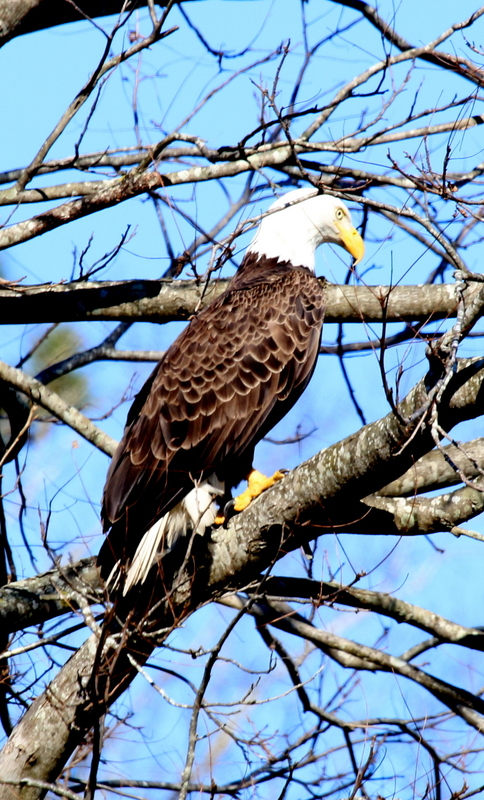 We didn't spot our usual Bald Eagles though. 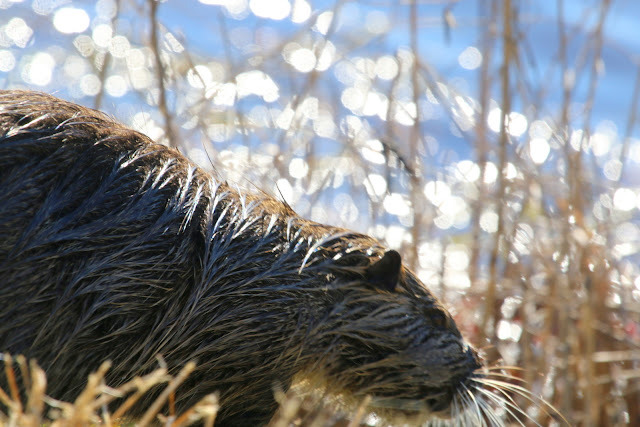 An unusual treat was to see two of those gigantic rat like creatures -- Nutria -- crossing the road and heading into the water. I had seen them before but never out of the water. They have very ugly gigantic blue buck teeth. 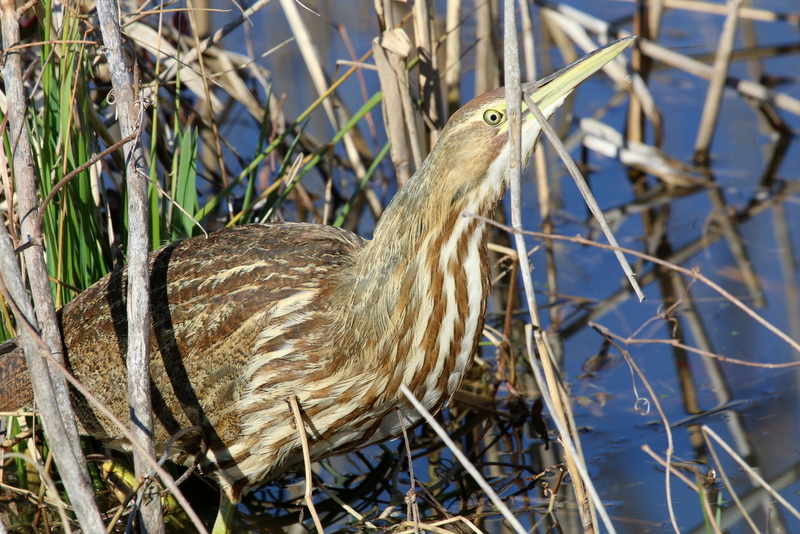 This is an American Bittern. 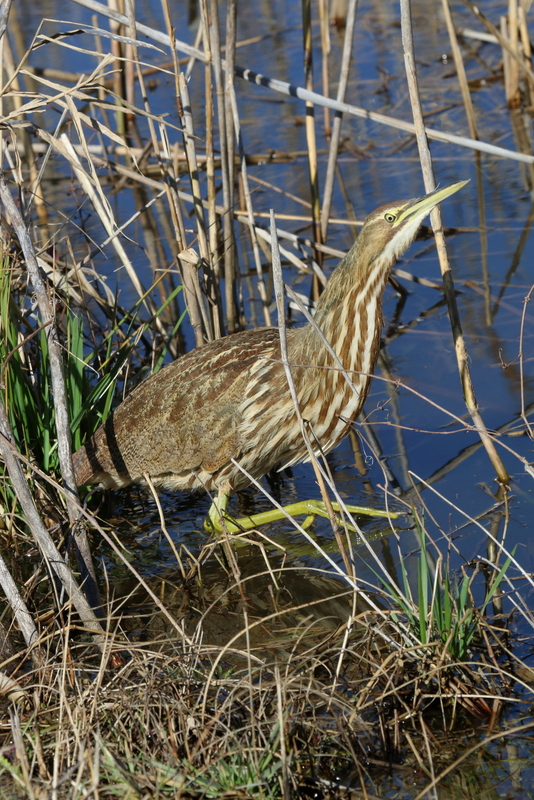 We have seen this bird quite often here but he was in a slightly different place. He thinks he is hiding from us! Look at those big yellow feet. He deserved a closeup in my blog and may find himself in a quilt eventually. I was surprised by seeing this Meadowlark sitting on top of a small tree off in the field, luckily where the sun was good. What a handsome fellow. We headed off to the Outer Banks from Mattusmuskeet. 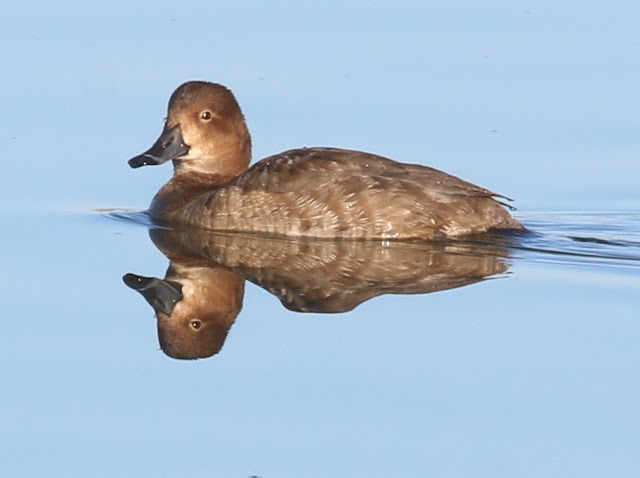 We had decided that Pocosin Lakes might be too muddy this year as there had been so much rain a couple of weeks before. Again this was a different angle from Bodie Lighthouse. 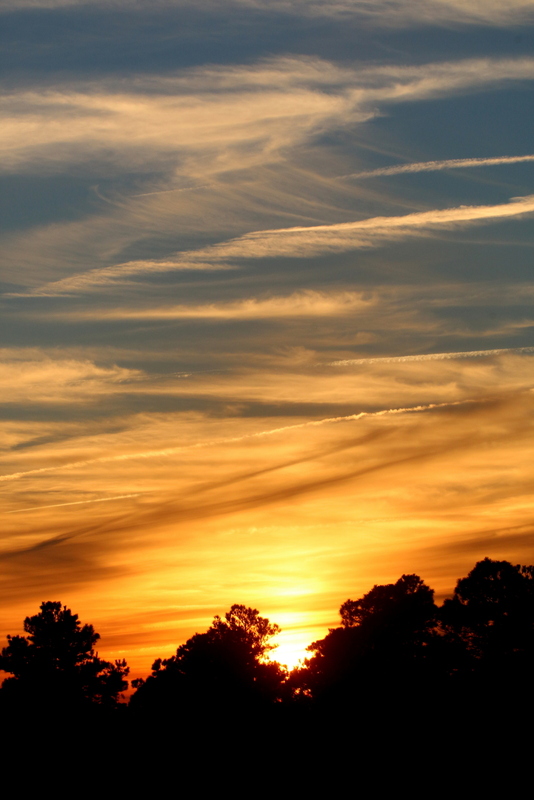 I liked all the pastels -- my daughter declared sunsets boring. The next morning we headed out bright and early to Pea Island National Wildlife Refuge. I might note that these are all national reserves and therefore unmanned while we were there and the only facilities were porta-potties which fortunately all had paper. I had gotten only about 4 hours of sleep because of the couple next door who woke me up at 3 and as I was intending to get up at 6, I didn't ask for another room but read for the rest of the night as there was no hope of sleep. I did take the Do Not Disturb sign off their door the next morning though! The above picture and this one are of American Widgeons. 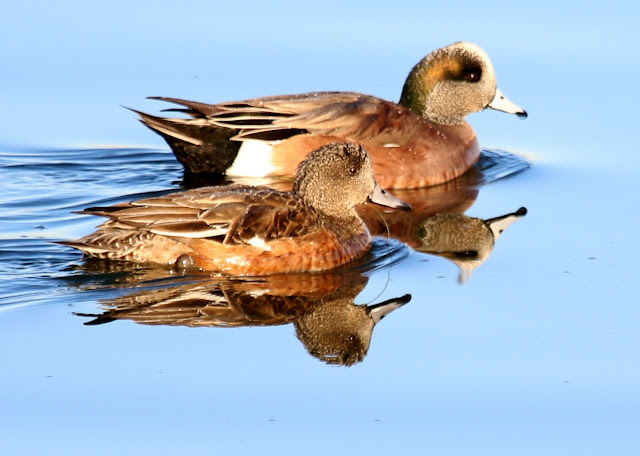 There was so little wind and it was so early in the morning, the light was absolutely ideal for these wonderful pictures of the ducks with their reflections. 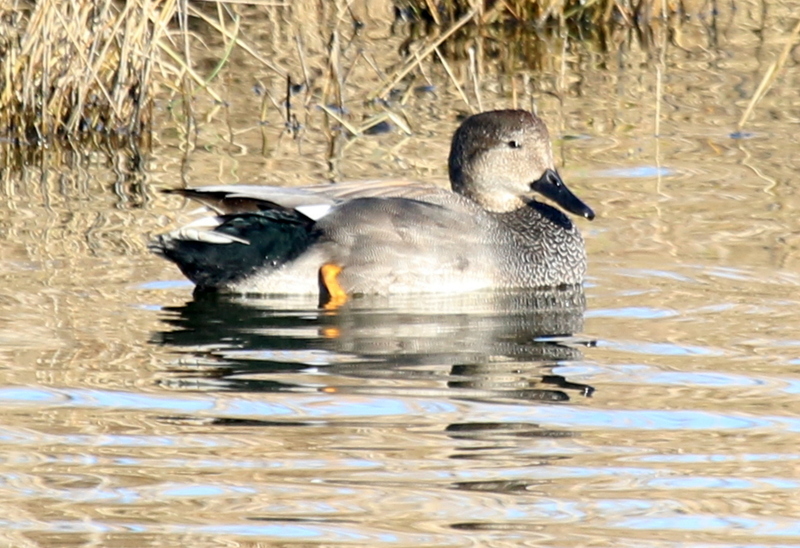 I believe this is a Blue-winged Teal female. This is one of the many Gadwalls that were there. This is a Greater Scaup. This is a male Ruddy Duck. 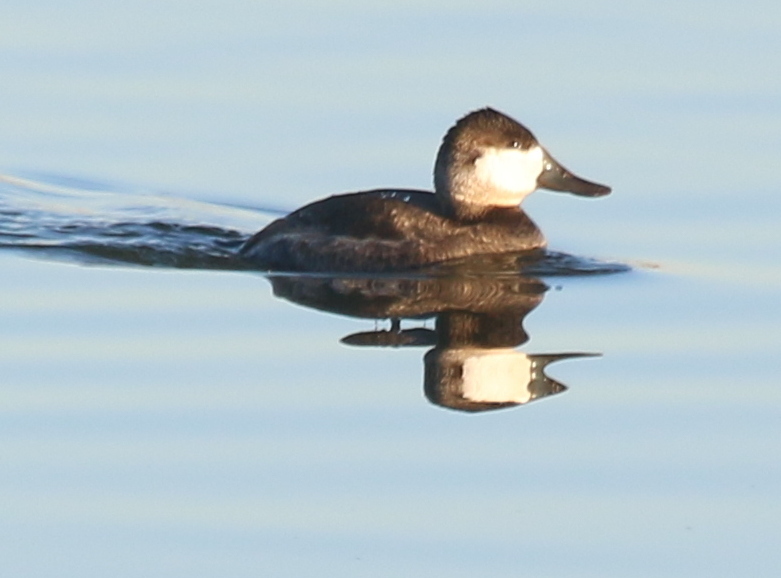 There were a lot more females than male Ruddy Ducks there. This was just a fun picture of sleeping female Ruddy Ducks and their perfect reflections. 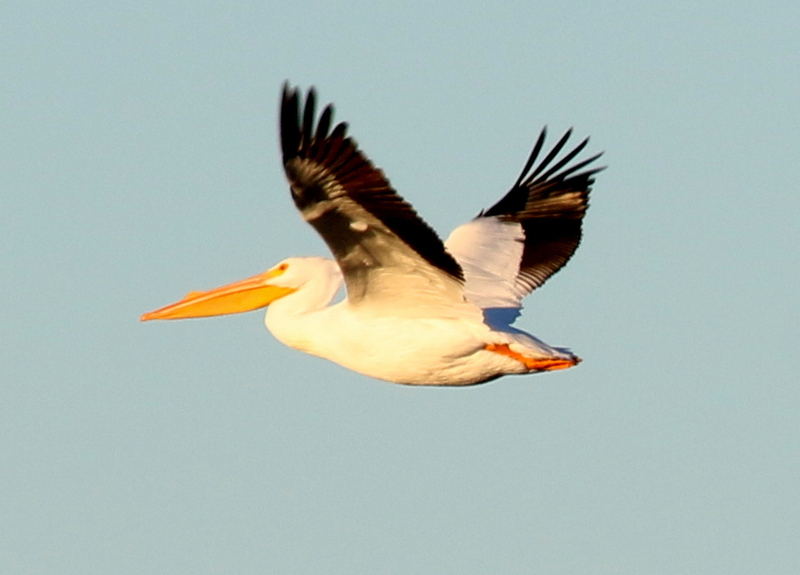 So glad we got to see at least one White Pelican and even got a decent picture before he left! 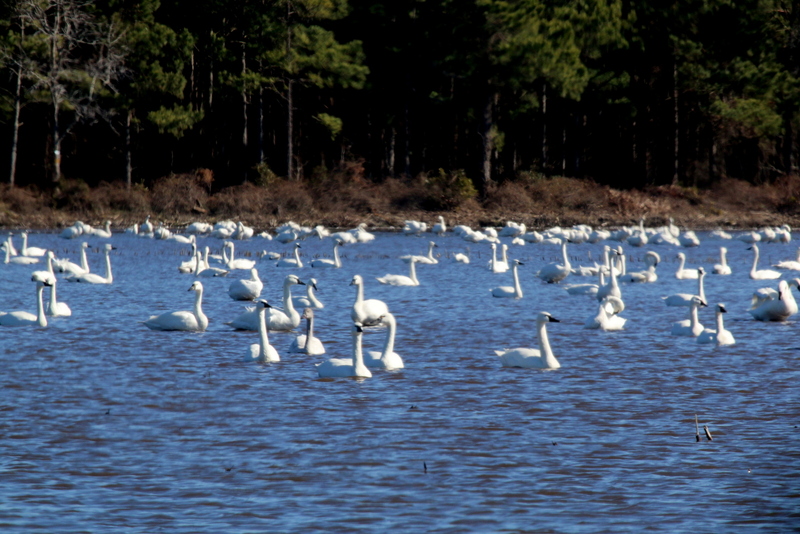 There were a lot of Tundra Swans here as well. Off in the distance at Bodie, there was a large flock of Red-headed Ducks but the light was too poor to get pictures. We hadn't seen any Bald Eagles until we were driving home on Rt. 64. I was asleep but my daughter spotted this one off in a field on my side of the car! So we saw our Eagle finally. We see one almost every time we go there. 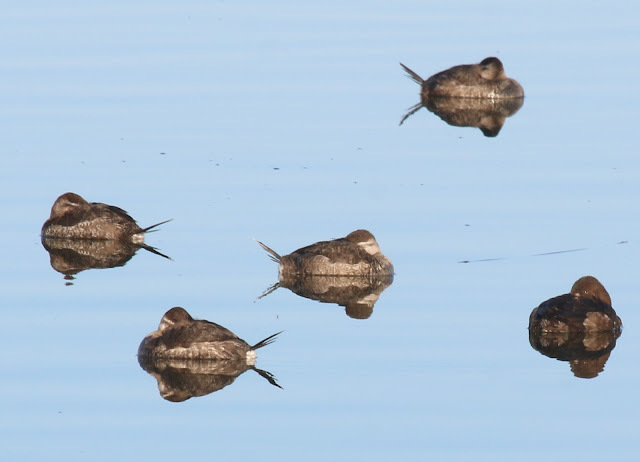 I LOVE the picture of the Ruddy ducks sleeping and their reflections. SO COOL! I have always wanted some color in my white hair! 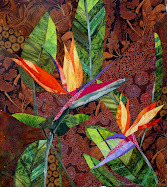 Mr. Pelican - 46" x 34"
Serengeti Lions 60" x 45"
Dreaming of California - 30" x 40"
Lilies - 35" x 45"
Yellowstone III - 30" x 40"